Type visualizers are a powerful mechanism allowing you to display the variable values during debugging in a more user-friendly way than simply listing all members. This is extremely useful if your program contains custom STL-like containers or string classes. This tutorial shows the very basics of making a simple type visualizer and registering it with VisualGDB. 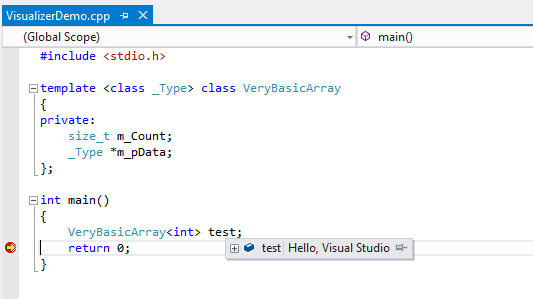 It will simply make VisualGDB show “Hello, Visual Studio” instead of the actual value for a given C++ class. Create a simple “Hello, World” application with VisualGDB. Although the type visualizers will work for all projects types, the most simple way to start is by creating a MinGW application (follow this tutorial). We will now make a VisualGDB plugin that will replace the value of test (“m_Count = 68, m_pData = …”) with a custom string. Please refer to the SDK reference for more information about things that type visualizers can change. Right-click on the newly created project, select “Add Reference”. Select “Browse” and point to the VisualGDBExpressions.dll assembly inside the VisualGDB directory. Ensure that the VisualGDB installation directory is specified correctly. Build the project. Ensure that your DLL has been copied to the TypeVisualizers directory inside the VisualGDB directory (the directory should already contain STLTypeVisualizer.dll). Start debugging your project. Another instance of Visual Studio will be executed. 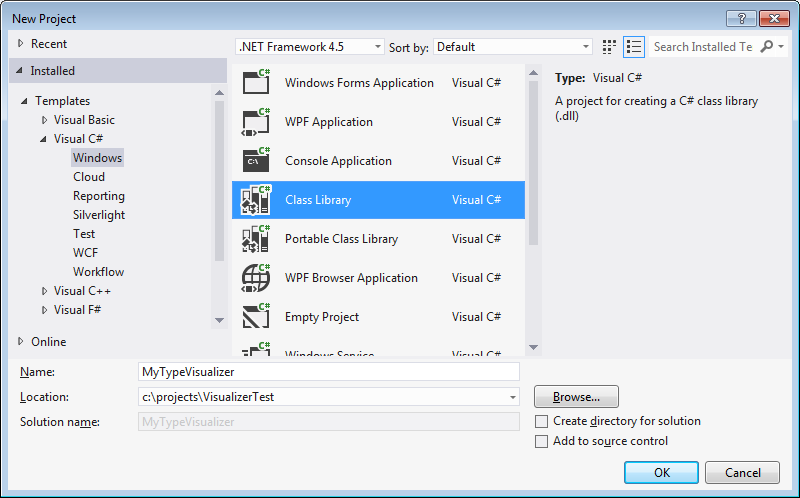 Open your VisualGDB-based project using that Visual Studio. Put a breakpoint on the return statement and run the project. 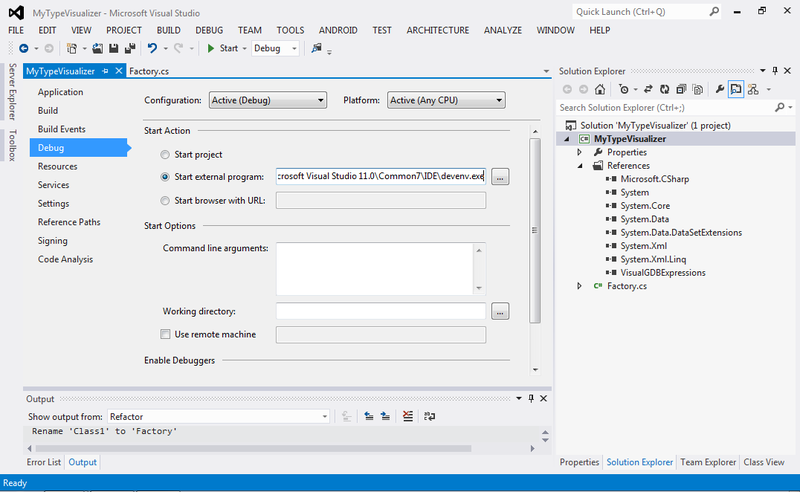 Go back to the outer Visual Studio instance, set a breakpoint inside the DoAttach() function, go back to the inner Visual Studio and hover the mouse over test again. A breakpoint will be triggered. 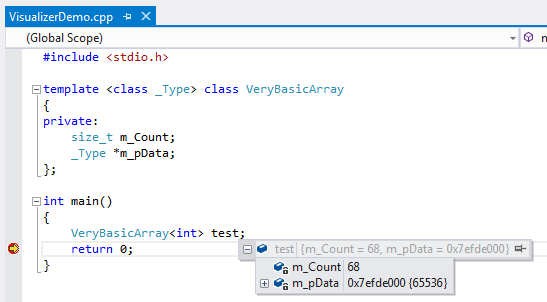 Do not evaluate the IExpression members in the outer Visual Studio. This would require a cross-thread call that cannot be performed while your plugin is stopped at a breakpoint. Now we are ready to make a meaningful expression visualizer. Follow the next tutorial to make this visualizer display array contents in a structured way. This section explains how the basic visualizer implemented above works. When we inherited the TypeListBasedExpressionFilter class and specified “VeryBasicArray<” in the constructor, we have created a simple filter that only attaches itself to instances of the VeryBasicArray class. The DoAttach() method essentially allows replacing an expression (the original value) with another arbitrary expression returned by the method. However, instead of implementing the IExpression interface manually we have used the StaticExpressionFilter class to make a clone of the original expression replacing the value with our string (represented as an instance of ExpressionValue.Custom). You can download the source code for the example in this tutorial here. The code in the archive is provided under the BSD license.